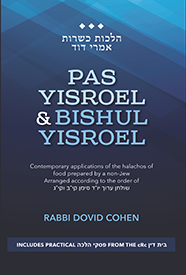 Kanfei Yonah, Rabbi Yona Reiss’s newly published sefer, is a collection of essays and responsa relating to a variety of contemporary halakhic and hashkafic issues. Among the many subjects included in the sefer are pre-nuptial agreements, agunah and mamzerus issues, geirus questions, Beth Din procedures, and contemporary commercial disputes. Divrei bracha for the sefer are given by many Rabbonim including the two current Chief Rabbis of Israel, Rav Yitzchok Yosef and Rav David Lau, Rabbi Gedalia Dov Schwartz, Rabbi Shmuel Fuerst, and Rabbi Dovid Zucker. 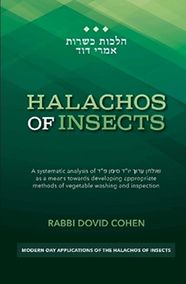 Modern-day Applications of the Halachos of Food Prepared by a Non-Jew. Arranged according to the order of Shulchan Aruch YD 112-113. A collection of postings that Rabbi Dovid Cohen made six days a week for a year to cRc Food Service Mashgichim on their WhatsApp group. Those posts have been collected and are printed in this book, with a few additions. This collection of 99 biographies with over 300 photographs of Chicago Rabbis tells the story of Torah Judaism in the city, and shares the inspiring legacy left by the rabbinic leadership of the era. This was the final project of Rabbi Moshe Kushner, z”l, a dedicated son of Chicago who served in many communal leadership capacities, including that of Executive Director of the Chicago Rabbinical Council. If buying outside the continental United States please call our order line at 773-250-5499. This sefer includes a biographical sketch of HaRav Gedalia Dov Schwartz, a compilation of lectures HaRav Schwartz delivered on American Orthodox Jewry, and a collection of the Rav’s teshuvos, originally published in a column entitled, “Ask the Rav.” The sefer concludes with two detailed halacha shiurim on the halachos of wanton destruction of property and triage in halacha. Topics include those with whom yichud is permissible, at what age does the issur begin, dealing with babysitters, domestic help, doctor visits and more. This booklet deals with topics such as the commandment to love converts and the prohibition against taunting or oppressing them. It includes personal statements from converts, questions and answers, and references and citations. This wallet-size reference card presents many common kosher symbols that the Chicago Rabbinical Council accepts, and is a wonderful resource for consumers.